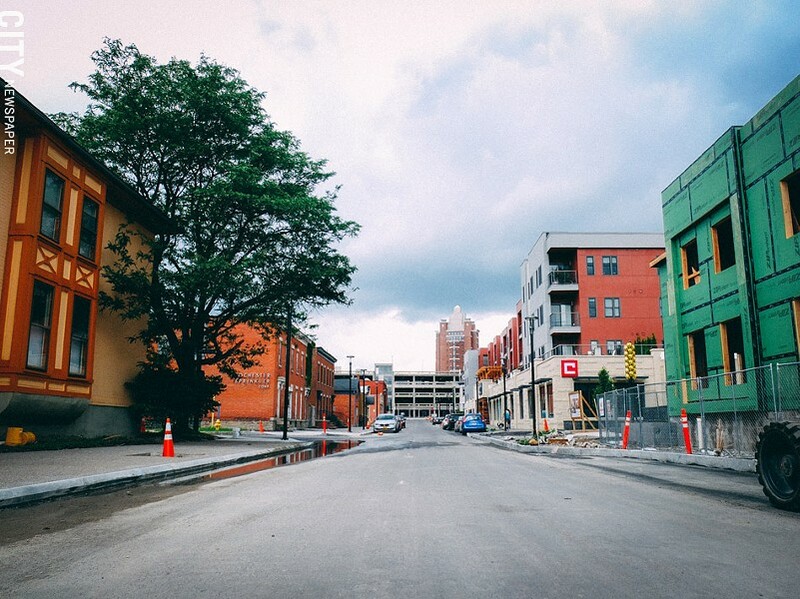 The City of Rochester, says Maria Furgiuele, is experiencing a long-awaited renaissance, and it has a chance to shape its future in a way that will benefit all of its residents – and attract new ones. 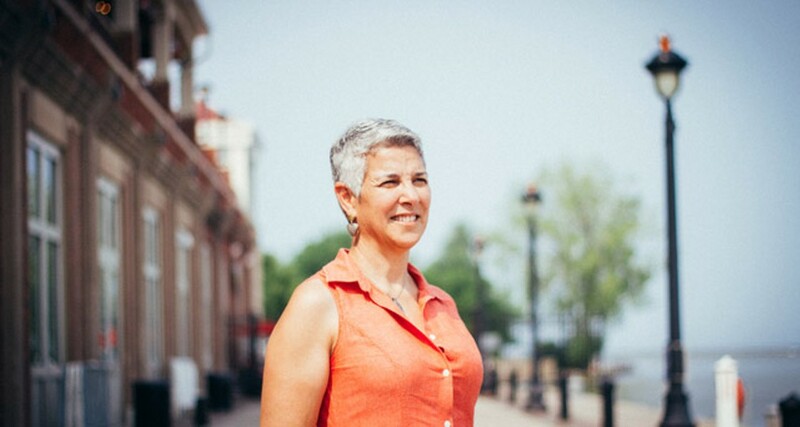 With thoughtful planning, she says, the city can provide quality housing for all of its people, create mass transit that serves the public and protects the environment, and preserve its older buildings and create well-designed new ones. And she wants her organization to be involved in that planning. 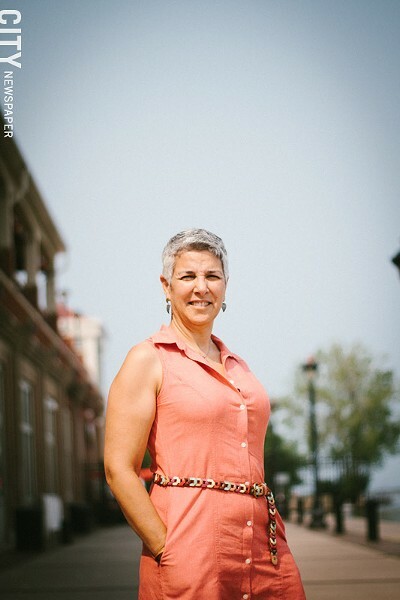 Furgiuele is the new executive director of Community Design Center Rochester, a non-profit organization that, in the words of its website, promotes "healthy, sustainable communities" by encouraging quality design, planning, and "thoughtful use" of buildings and natural resources. CDCR is known for its community charrettes, which bring together community residents to plan future development, and it has become a strong resource for city planners. Its speakers' series have highlighted the achievements of mayors and urban planners from communities around the country as they've faced obstacles to redevelopment in their cities. The organization was sort of an offspring of ARTWalk, says Maria Furgiuele. When the Department of Transportation planned to widen University Avenue, a group of neighborhood residents and architects pushed back. The architects worked with the community to re-imagine University Avenue with new sidewalks, cutouts for parking, and space for street art. Their hope was to help create a new and interesting experience out of a street that some people saw merely as a highway in and out of the city, says Furgiuele. "Obviously we know now, almost 20 years later, how successful that was," she says. That small group of architects later formed CDCR, and Furgiuele recently became its new executive director. Since then, CDCR has expanded its influence beyond the city, guiding communities like Rush and Penfield – areas where cars are so dominant that they've nearly erased town centers. Rochester's design center is one of many at work throughout the country – born, Furgiuele says, "out of the urban renewal era." "We saw the beginning of urban sprawl and everyone leaving the city to beautiful green pastoral suburbs that reflected a certain way of life and a middle class affluence," she says. "Now, 50 years later, we're seeing the impact of that kind of development." "We had to build a huge infrastructure to facilitate how people move around, places that are less dense, where everybody needs to have their own car," Furgiuele says. Looking back, we see the negative impact, "because we can't build enough parking lots and garages to accommodate the cars. Roads are becoming ever wider to accommodate more cars and faster traffic. And every one of those things has incrementally deteriorated the urban fabric physically, and more importantly, our urban experience emotionally." The mission of design centers like Rochester's "is to help people become engaged in the design decisions that are being made that impact their neighborhoods and communities," Furgiuele says. "We really have a social equity component to our work. And areas where people have done this have seen real success. We can see cities that had these conversations 20 and 30 years ago." For example, she says: "Portland would be a model city for transit. Certainly they have other problems, but they wanted new transit options to limit the growth of roadways and sprawl." "We're looking at riverfront development in Rochester," she said. "So many communities across the country are looking at creating artificial waterfronts because there is such a great return on investment. It's desirable, a thing that people want. But right here we have more natural waterfront than people can imagine, and we're just beginning to understand the true value of the river and how to put it to its best future use." Furgiuele has a long history with CDCR. An architect herself, she is also a real estate agent, was a volunteer for CDCR, and served on the organization's board, eventually becoming president in 2014. In a recent interview, she talked about the importance of planning and design in creating livable, sustainable communities. The following is an edited version of that conversation. CITY: Some people may consider design as simply a lot of froufrou. FURGIUELE: In tough economic times, artists, architects, and designers are often viewed as non-essential. They're frequently seen as the frosting on the cake. But design means planning. It means intentionality, and it means thoughtfulness – and that's critical. We know for economic and environmental reasons that we need to build for more density. There's a need to conserve resources, and there's a need to share as much of the available resources as we can. There's also the growing understanding of the health implications of good design. It's a fact that living in walkable communities contributes to better health. And there's the social aspect. We're seeing society physically disconnect. Technology is important, but it builds control over how we experience things, and for many people that has become an isolating experience. It makes a big difference in how an open space is created, and how that space is used. And that has a lot to do with how it is designed. More people, particularly younger people, get this. As CDCR's new executive director, what are your priorities? We are going to be 15 years old, and so many people outside of the architectural community don't know we exist. That's going to be my biggest challenge. There's so much going on in Rochester right now. We are really going through this amazing renaissance. It's been building and percolating for a long time. We've been involved in that, but now we have to really help guide that work. 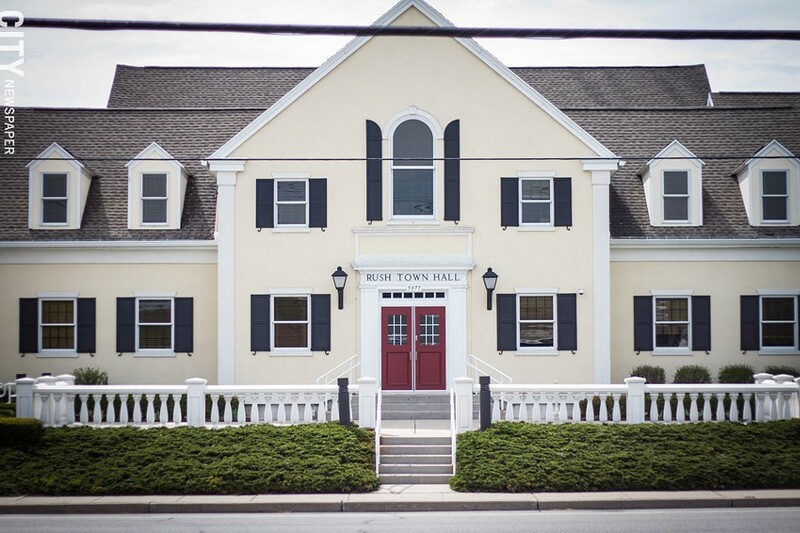 For instance, I think what's urgently needed in this community is a better appreciation and understanding that existing structures should not be torn down to do something like create surface parking or roadways. It's not that we can't take down buildings or that everything must be preserved. But every time we tear a building down in the city, it's a rip in the fabric of the city and it weakens it. Would you include zombie properties? Yes. Understand that properties become zombie properties over time. If we had a way to identify those properties earlier, maybe we could capture them and reutilize that space before they are abandoned and sitting vacant. It's usually better to have a family to come into a house in a neighborhood than to tear the house down. For instance, when you look at places like the area around Hudson Avenue, where we just did a design charrette last year, there are residential streets that have been wiped out with maybe two, three, or four homes left standing. We're working with people in that community, because there are wonderful assets there like the Jordan Health Center. But it's a real challenge to weave neighborhood fabric back together. What trends are influencing planners and designers, and where does Rochester stand in those trends? We're most influenced by what is referred to as the "new urbanism" movement, which is really about recognizing the value of urban environments and replicating some of the features that people seem to gravitate toward. It's a movement that's about 30 years old, and I would say Rochester is a little late to the party. It's happening here now, but other cities grabbed on to that idea and began making changes that they are now benefiting from. The good news is that there isn't a whole lot that we need to invent. We have wonderful examples of what works that we can kind of pick and choose from. We can look at Portland as a great example of a city with a good transit system or Chattanooga for its wonderful example of riverfront development. There are so many places around the country doing extraordinary work that we can look to as models. The problem is, we're always willing to make excuses, like "the weather here is terrible in the winter." Well, the weather is cold in Toronto, too, but they have a thriving waterfront year round. It's the same weather, maybe worse. We just had Kim White, president of the River City Company in Chattanooga. She was here to speak about that city's riverfront development, and the first thing that someone said to her was, "Well, of course you can do that down where you are." And the she turned around and said, "Wait a minute, my summers are so hot and muggy." Her point was, every city has its challenges. Charlotte Street, which used to be split by the Inner Loop, now connects downtown to the University-East Avenue neighborhood to the east. Above: the new Charlotte Square residential complex on the west side of the Loop infill. The other point that Kim White made was that they rebuilt the waterfront for their residents and the tourists came after that. "We didn't build a city riverfront that would attract tourists," she said. And I think that's a great starting point for Rochester. We already have more than 200,000 people who live here and businesses that want to be here. You're working with the Charlotte community. The fast ferry didn't work out, but it did seem to awaken people to the possibilities for the waterfront and harbor area. Everybody brings up the fast ferry as a folly, but I disagree. It was a great thing. As a business owner on Park Avenue, I knew exactly when the ferry started running. I always engaged people in the shop and often asked where people were from. These ladies one day said, "Oh, we're from Toronto. We took that fast ferry. We couldn't wait for it to get started." This was in the first few days of its operation and, if you recall, Lake Avenue was all torn up. So they took a cab up to Park Avenue. I bring this up because this is one of the problems we have in this community: we never feel that we're worthy of anything. Another city can do this or that, but you'll always hear someone say, "That will never happen in Rochester." And we have so many amenities, natural resources, and beauty here. The ferry did help to make people think of the area as a waterfront and as an entrance way to the city and the region. But cities like Rochester, Buffalo, and Syracuse actually have lost a huge percentage of their populations to places in the South like Chattanooga and Austin. We're trying to keep the residents and businesses we still have. Sure, people are going to places like that for the warmer weather, but it can also be for other reasons. If you build an interesting place, people will want to go to that place for that experience. We've existed by giving companies incentives, and we're trying to bribe them to come to our urban centers. One of our other speakers said that they focused first on creating "a place," and those investments attracted new people and businesses. We're kind of seeing that now with all of these office towers that are being converted to residential space. Why did we ever expect a city to survive when it was only one dimensional? It makes sense that for a city to be vibrant and support itself, it needs residents. But it also needs to be interesting before it can attract those residents. I walk blocks and blocks when I'm in New York City, and I don't think anything of it because it's fun and it's interesting. Here you might walk three or four connected blocks and then you have this big open space that you have to traverse, a blank wall, or an open parking lot. And you lose interest. We have to begin to fill in all of those blanks and create interesting, continuous space. And it can't be punctured by driveways every 100 feet, because that makes it unsafe for pedestrians. We really have to make the commitment to make urban spaces for pedestrians. It's critical for the life of this city, and we've been afraid to do that. Too much in Rochester is driven by parking. We have to start thinking of other options, because we can never accommodate the car enough. The charrettes are a blast, but how do you keep the process moving so that after you've had this brainstorming, people see the fruition of their work? The frustrating thing is that we have these expectations that these places will be transformed in two, three, or five years. Good places take time and incremental development. We can look at Portland, and what a great transit system, but it wasn't great in Year 2 or Year 5. The Community Design Center has expanded its work and is helping residents of suburban areas like Rush plan for the future. What's your view of some of the projects underway like Midtown, filling in the Inner Loop, and the proposal for the performing arts center? The best thing that has happened to this city in the last few years was the dismantling of the mall. There was a lot of criticism about the way it came about. But we know now that malls are on the decline. They're dying, and they leave these vast holes. In most cases I support preservation, but in this instance, I think dismantling it was the right decision for us. We know that we need to weave the city back together again, CDC was whole-heartedly in support of filling in the Inner Loop. That is about knitting back the fabric of the city, eliminating barriers, and helping these neighborhoods mend. And we're already seeing that happening. We already cross Charlotte Street like it was always like it is now. When Mayor Warren was beginning her term, she wasn't completely sold on it, and she questioned it. But as she has met with other mayors, she's found that people are talking about it. This is a huge thing that administrations in other cities are looking closely at. The next thing that is going to happen, hopefully, is that we're going to fill in most of the rest of the Inner Loop. That would allow some of the area north of downtown, much of it low-income housing, to be more available for development. The goal here is for more integrated communities. We don't want to push anybody out, but we know that right now it exists as a community of concentrated poverty. We need to create housing for the people that are there now, but also have housing for other income-levels. This would begin to impact that concentration in a positive way. Few people would connect design to breaking up the city's concentrated poverty. And that's the argument that I have to make, because that is the most critical need facing our city. And we know that just planting a few trees, making the streets prettier, or giving people new housing isn't going to help. What will help is affordable housing, but I hate the typical formula that's used for building affordable housing. There should be all strata of residents and incomes, and a percentage of those residents should be subsidized. They should be integrated. We build affordable housing that typically has income parameters. Developing diverse housing means that there will be tiny units and big units, luxury flats and studio apartments. Every new development needs to have that diversity. It can't be just for certain people. Something else that would be impactful is a bike-lane system that goes all around the city and gets people around in a safe way. I volunteer at R Community Bikes and every Wednesday we give away so many bikes that we run out. We have more demand than what we have available. For many people, this is the only reliable way to get around. If you want to impact poverty, this is one of those things that is easier to do. We're still seeing some people saying that filling in the Inner Loop was crazy: "whose pie-in-the-sky idea was that?" Well, you have some people who question why we need a performing arts center. I don't think enough has been done to educate people about why these things really need to happen. The Inner Loop needed to happen because the infrastructure was crumbling and there wasn't enough money to repair it, and you're going to see more of this through the state and the country. And the same thing has happened with the performing arts center. The arts center we currently have doesn't have air conditioning, and it doesn't have a big enough stage: things that limit the theater's opportunities. So I fully believe that having a new performing arts center would be a wonderful thing, but I don't believe that Parcel 5 is the right location for it. This is my opinion and not an official position of the CDCR. We have the Eastman Theatre at one end of Main Street and having the performing arts center at the other end, let's say near Court Street, would be a better choice. It could be strategic in developing the space between the two sites if it's done right, rather than having everything clustered in one node. And when you look at Parcel 5, think of New York City without Central Park. New York City is in many ways defined by Central Park. Rochester has this incredible opportunity: this terrific space is in exactly the right location, facing our Main Street and the Sibley Building. It's huge, which makes it versatile. It could be used for so many things, festivals, music concerts, and events – and most important, it could be interesting. Someone approached me the other day and said wouldn't it be great to have the performing arts center in Charlotte, where there aren't as many things happening during the winter. And we want this string of pearls up and down the river. So that's another idea. We have to have a plan for the whole city, a vision, and right now what we have is scatter-shot development. I often say that the only thing that's worse than doing nothing is doing the wrong thing. And that would be so frustrating, particularly when we have so many wonderful examples of how things can be done well. There's no excuse for it not being done to the very best standard.